The guitars made by Ignacio Fleta are renowned for their tremendous power, making them ideal for the concert hall. 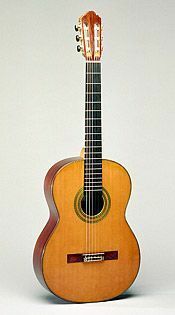 Fleta made his first guitar in 1930, having already constructed many violins and cellos. After hearing Andre Segovia playing in 1955, Fleta was inspired with the determination to make good guitars, and he produced a guitar for Segovia, which was played by the master all over the world. Fleta's violin-making background can be seen in his method of making the guitar - he preferred to complete the sound box, or body of the instrument first, and then joined the neck on afterwards, in the same way that violins are assembled. The plan offered here shows Fleta's method, but it is equally possible to follow his design in all respects except for the neck joint, which can be done in the traditional Spanish way. Of special interest in Fleta's design is his strutting pattern, which employs nine fan struts and a sloping harmonic bar, which helps to increase the volume and clarity of the treble notes.